Land Speed Racers throw down more than a dozen plus 400 speeds as 433 amateur land speed racers try to earn national records on Bonneville Salt Flats. 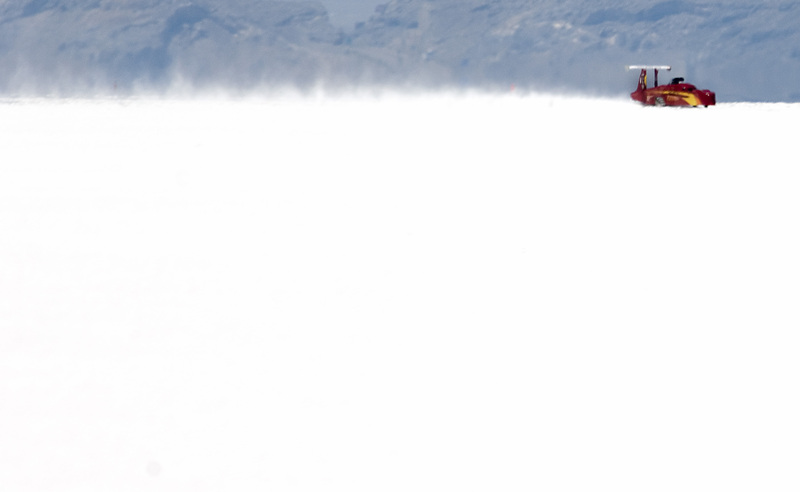 For the first time in years, the salt crust on the BonnevilleSalt Flats has renewed itself enough to support some mighty exciting speed trials. Although far from what it needed to safely conduct world record attempts, several national records were inked recently. 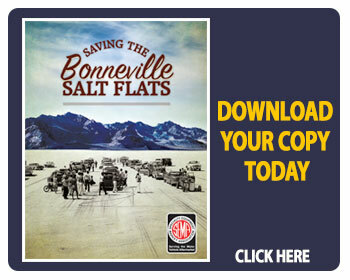 The SCTA/BNI Speed Week And Bonneville Motorcycle Speed Trials were a splendid way to return to the salt after many years of poor conditions and rain outs. 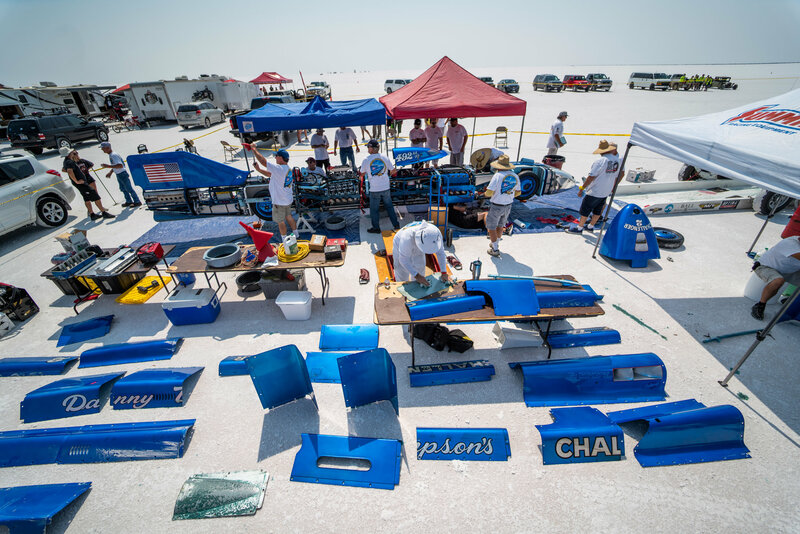 Though somewhat repaired, the salt crust remains thin and fingers are crossed that the racing surface will support the racing hopefuls competing in the remaining three events: USFRA World of Speed (SEP 14-17)and SCTA World Finals (OCT 2-5 ). 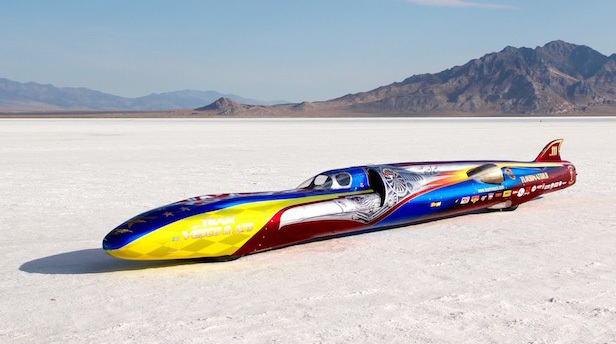 In some doubt is the Land Speed Events Top Speed Shootout (SEP 20-24) because its competitors demand greater lengths of solid salt to accelerate, be timed and then safely slow down. 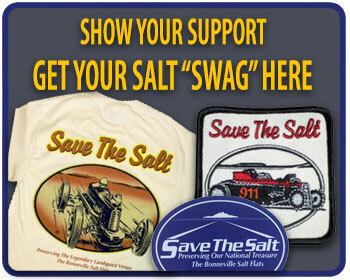 A minimum of 8 miles of sold salt is required. In seven days, five cars threw down speeds in in excess of 400 miles per hour captivating attention of racers and spectators alike during the SCTA/BNI "Speed Week" held August 11-17, 2018 on Utah's Bonneville Salt Flats. All five drivers were north of 50 years old. 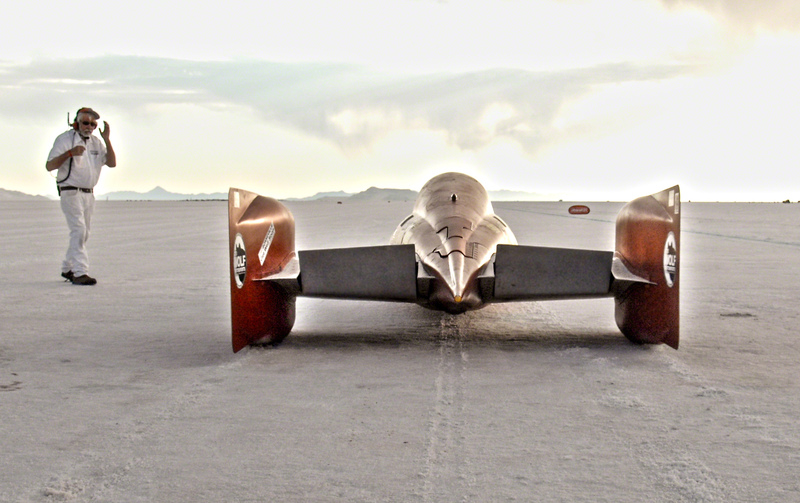 When engines cooled, the mega speed was turned in by Dave Spangler, 76, of Dana Point, CA, driving the TEAMVesco "Turbinator II" to a new 455MPH T-3 Class Record. The car posted a Terminal speed of 470MPH and earned the Hot Rod Magazine "Top Time" Trophy, an honor akin to winning and Oscar in motorsports. Wife Karen, may very well be married to the fastest senior citizen on earth. 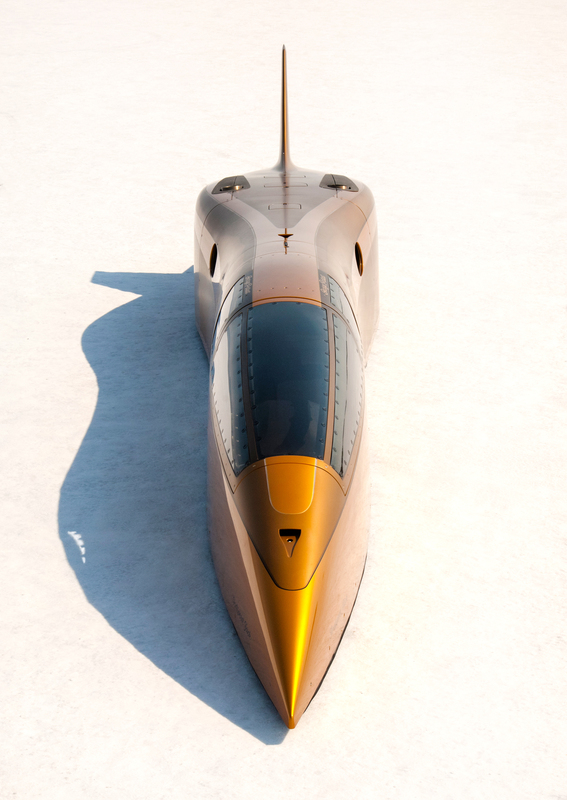 Next came Danny Thompson, 69, of Ridgway, CO. driving a heavily reworked version of his venerated father Mickey's streamliner originally built in 1968. 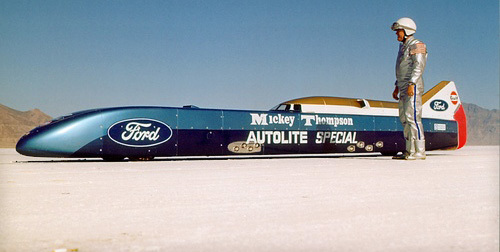 The brilliant blue 32-foot car "Challenger II" set a new AA/FS record of 448MPH - 50 years after it first turned a wheel. Thompson also managed to post 450MPH top speed before announcing the car's retirement from further competition. Some believe Mickey was his son's wingman on every run, yet watching the in-car video its crystal clear the kid was seriously in charge of the father/son speed machine. "It got a little squirrelly," commented Thompson of the 450 wild ride. "I was almost lock-to-lock at around 430mph, which was quite an experience. It wouldn't have been possible without the extraordinary efforts of my crew. The men and women who volunteered to join me on this crazy adventure are the reason for today's success. I can never thank them enough. " Normally the "defacto" winner of the HRM Trophy, this year Memphis, TN resident George Poteet, 69, and the "Speed Demon" team had loads of "learning moments" and only managed to make one-way runs - most in excess of 400MPH with one averaging 452 over a mile. That's express delivery. Poteet also turned in a 464MPH terminal speed letting TEAMVesco know they were very much still barreling down the glory road to 500MPH. Bob Dalton, 59, from San Martino, CA and his HEMI powered "Flashpoint" managed to throw a415MPH run into the books before the belts got to hot and spun off into shreds. With partners Jackson and Mayer, the nitro-blown team is certainly one of the most determined hot rodders on the salt. The "kid" in the 400 mix was was Rob Freyvogel, 52, form Butler, PA, who brought what may be the most stellar looking gravity-strapped speed machine on the salt and pulled down a pair 413 and 406 one-way trips through the timing lights before exploded the rear-end. If you wonder what such speeds feel like, all note the mile markers go by very quickly. For Freyvogel, Dalton and Spangler, it was virgin territory. "The car ran smooth, easy and boring," said Freyvogel of the "Carbinliner's" impressive numbers. "I didn't need to steer it much at all." Look for this car to do nothing but astonish every time it appears at the starting line. "I was still controlling wheel spin at the end of the 5-mile lights," remarked Spangler, who had driven 100MPH faster than he had ever drive a race car before. "The car acted differently and felt different going that fast, but instruments were indicating we could have reached 500MPH if we had the traction." Poteet's string of mechanical woes would normally dash the spirit, but his business acumen kicked in and noted that while Turbinator was the top speed dog, he managed to stay ahead of Thompson and pulled way ahead of Dalton and Freyvogel. "Makes no difference," he said with calm determination. "Just gives us a bigger reason to run faster." If the salt crust can be thickened through restorative and natural means, then a 500MPH run will certainly be the next velocity barrier to conquer. It is important to understand that all the runs and subsequent Speed Week records are National Records not World Records. World Records must be earn with 2 runs in opposite directions over the same piece of real estate within a 60-minute window and have FIA sanction. While all of the aforementioned cars are capable of surpassing world marks, only Speed Demon and Turbinate have earned those bargain rights with Turbinator the long-reigning monarch since 2001 when Don Vesco wheeled the original Turbinator to the 458MPH World Wheel-Driven record.